This was photographed draped over the sofa (and you can see bits of the back cushions) as it still needs the edging that will allow it to be fitted over the seat. Once it’s done, I will need to think about covering the arms and making a piece to go across the front of the base… perhaps it will be done in another three years! What I am really delighted about is how hard-wearing the cushions that I made first have been – no pilling, no sagging and the colours have not faded. 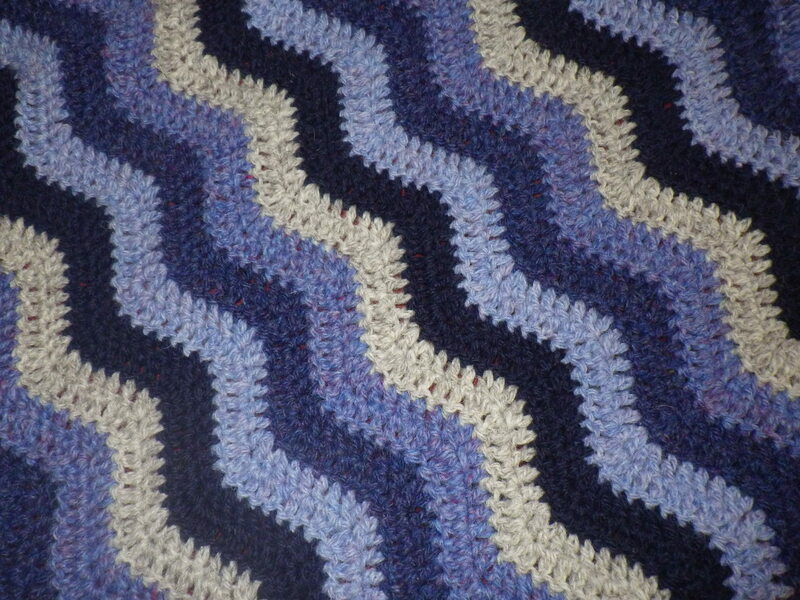 The wool comes from New Lanark and I can highly recommend it for this sort of project, as well as for warm sweaters. Next I planned to make a large rectangular piece to go over the seat cushions. The colours were the same, but this was stripy. I started, but I got really fed up with the very long rows and work ground to a halt. I also started to wonder whether it was the most sensible way to cover the seat cushions – would it move about to much when in use?. Boredom combined with uncertainty does not lead to finished projects and so it remained a work in progress. Initially I was going to make some gussets for the sides, but actually it works really well (at least for the time being) as a simple throw. 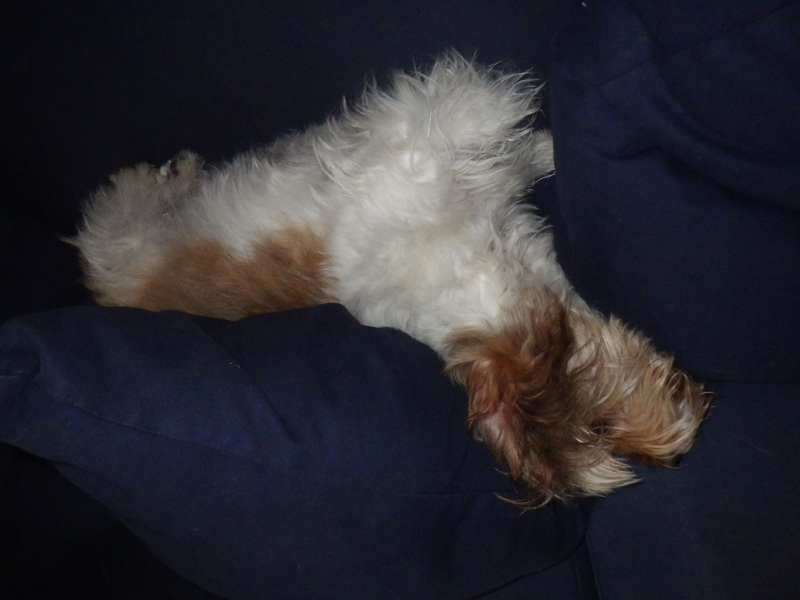 Of course, once the fancy cushions are in place, you can’t see much of the stripes, but I know they are there! So far all the work has been done using double knitting wool, but I’m going to progress on to something a little thicker now. Fortunately, New Lanark, who make the wool, do the same colours in aran weight and that’s what I plan to use for the seat cushion covers and the pieces to go over the arms… I probably need a sort of pelmet for the front too. This project is not over by a long way, but at least there aren’t any bits languishing around the house unfinished now. Funnily enough, I’m not the only one celebrating the end of a long-incomplete piece of work… The Twisted Yarn seems to be in the same position today. Anyone else managed a recent big finish? 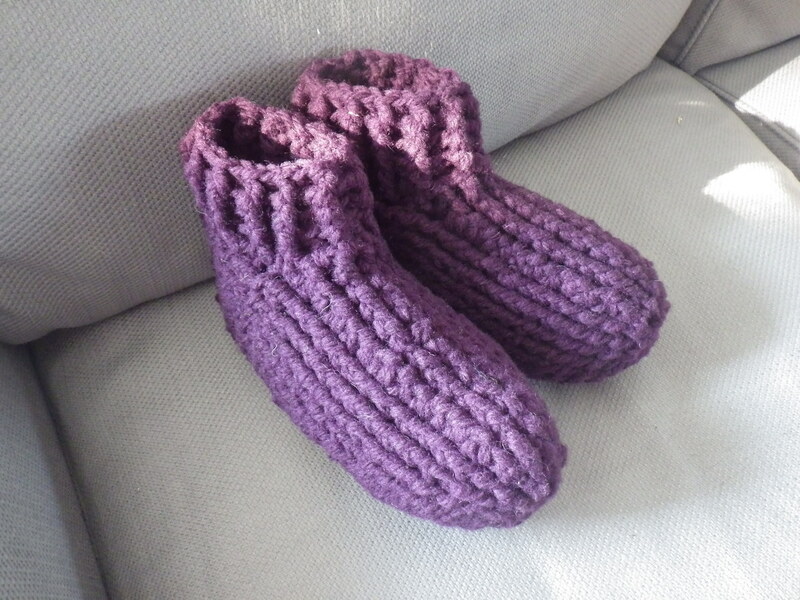 Recently I have written little about yarn, but this does not mean that I have not been busy with my hook (no knitting recently, although I am about to start a pair of socks). 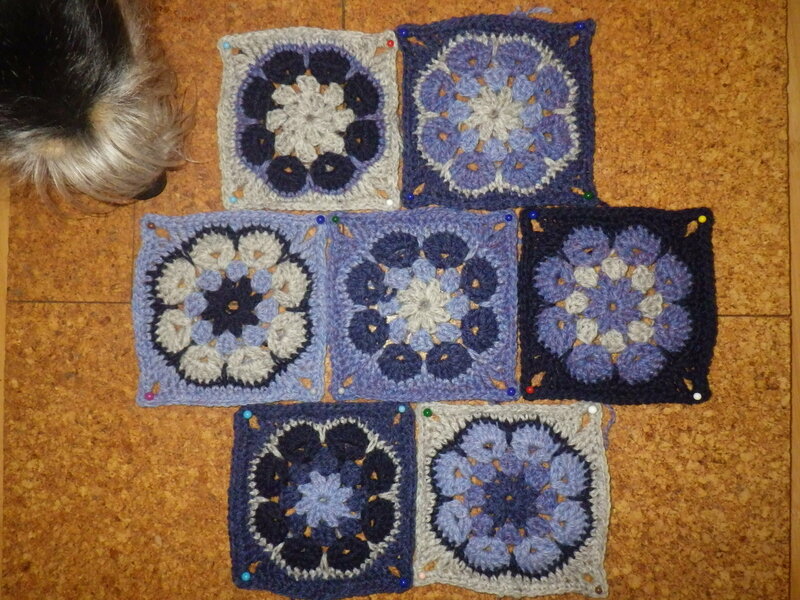 So, as a nice relaxing post for a Sunday evening, I thought I would share the progress on the sofa cushions. 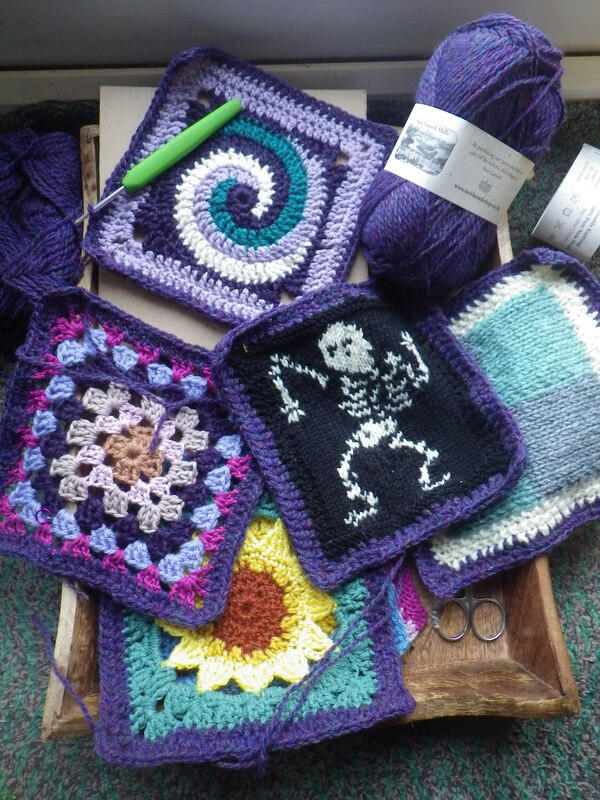 This is not the only crochet that I have been working on, but two completed pieces are yet to reach their intended recipients and I don’t want to spoil the surprise in either case. The yarn is 100% wool from New Lanark Mill, it’s all DK and the colours are navy, denim, blueberry (not much of this – only in the small squares), iris, sky and limestone. 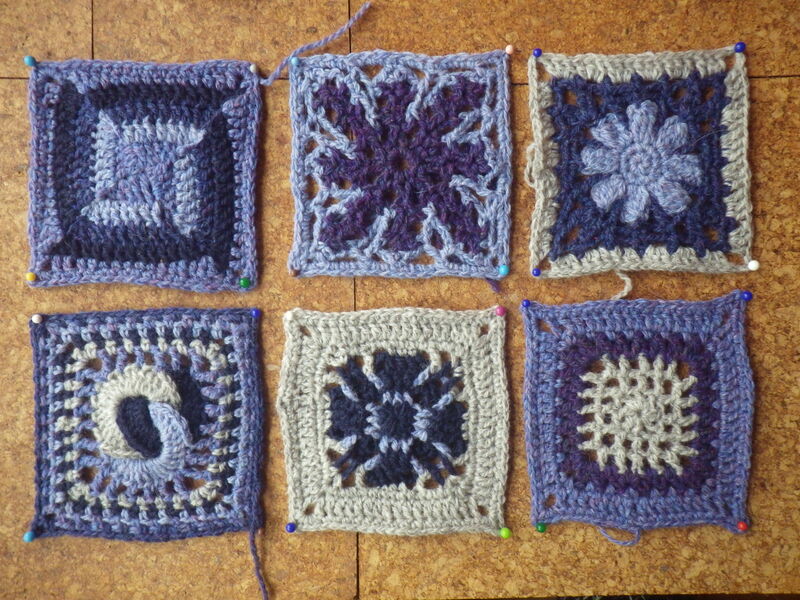 Now, excuse me whilst I retire with a glass of wine and a needle to weave about a million ends into the small squares! What is particularly good is the instructions are both written and in the form of charts. 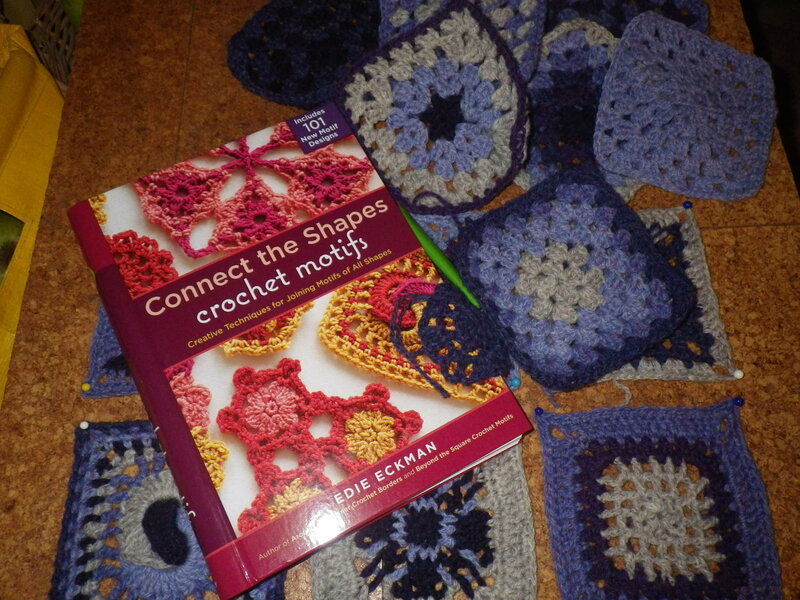 It’s great and I can see that quite a lot of my crochet sofa is going to be based on patterns in this book. So my UK wool week has been very productive… anyone else made anything interesting? My mum is currently in hospital having had an operation. When she comes out, she needs someone to be with her and had asked me if I would oblige. In theory she could have been released as early as yesterday, so I was prepared to set off in the afternoon to be at the house by early evening (it takes a couple of hours to get over there). I called the hospital in the morning and was told that she probably wouldn’t be released; this was confirmed in the afternoon. So, I’m still at home. Will she be released today? That remains to be seen… I need to phone again soon. The upshot of all this is that I just haven’t been able to settle down to do anything… there is paid work to be done, but I can’t concentrate on that at the moment. There are diploma designs to work on, but my mind keeps wandering. So the answer seems to be crochet and an audio book. 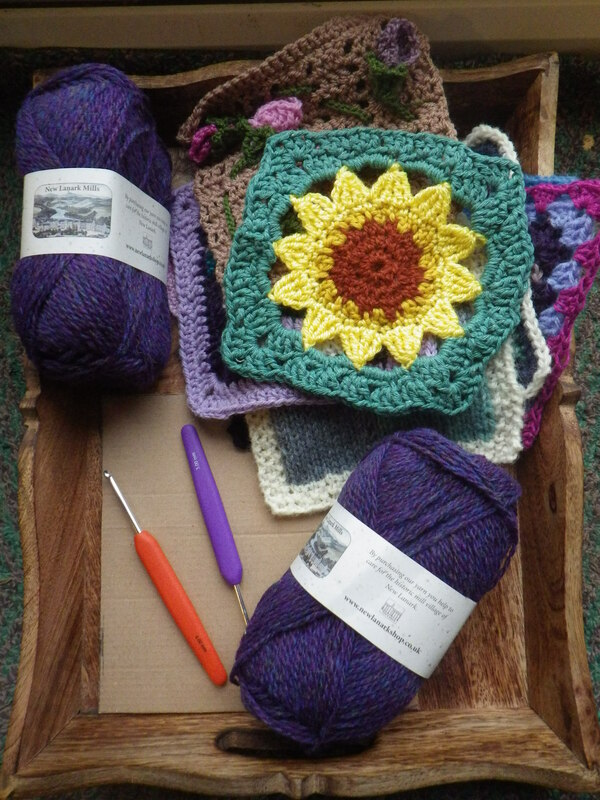 The arrival of the New Lanark wool for the masterpiece borders means that I have lots to do. 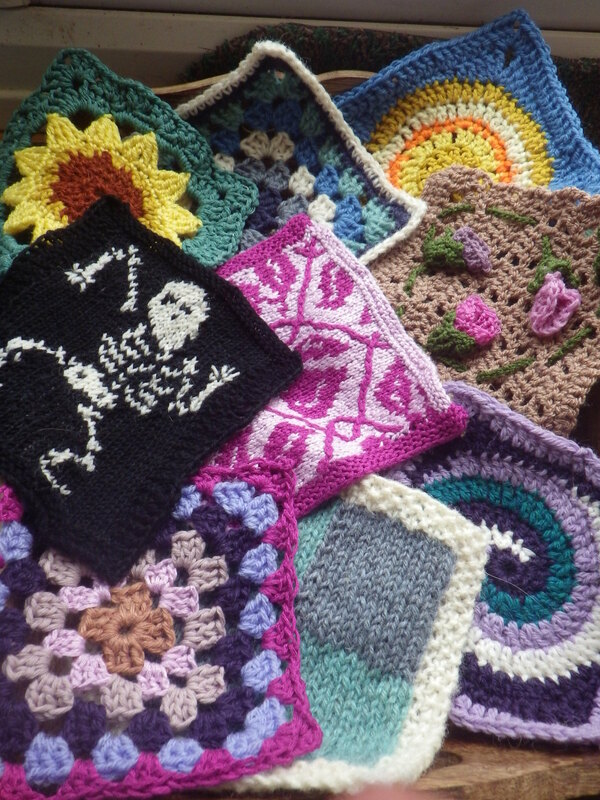 The squares are all supposed to be about 15cm (6 inches), but some are a bit bigger and some a bit smaller, so I need to ensure that each border makes the squares a standard size. To that end, I have made myself a cardboard template, so that I have something to aim at and I don’t have to keep getting a ruler out. I can place the squares on the template and ease them into the right shape, quickly getting an idea of how much edge I need. 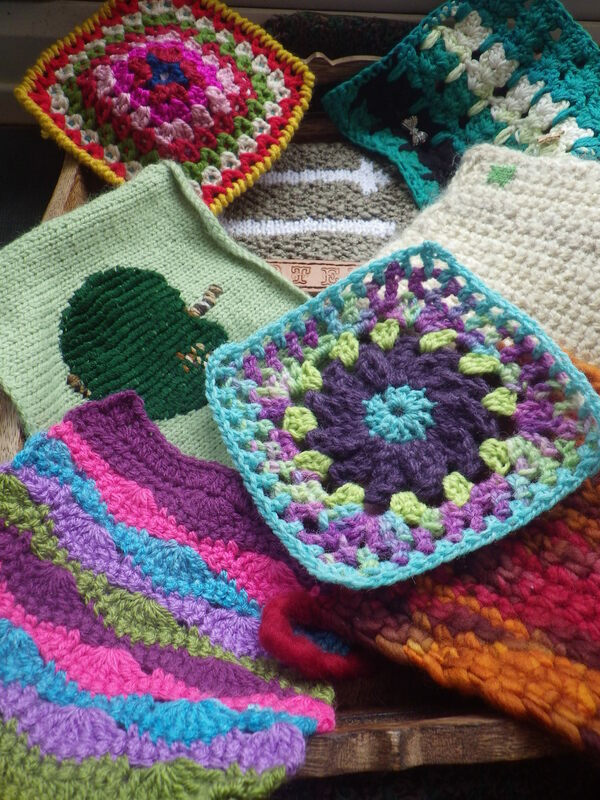 Of course, the stretchiness of knitted and crochet work does give me a bit of leeway, but it will be good to have squares that are close to a standard size. 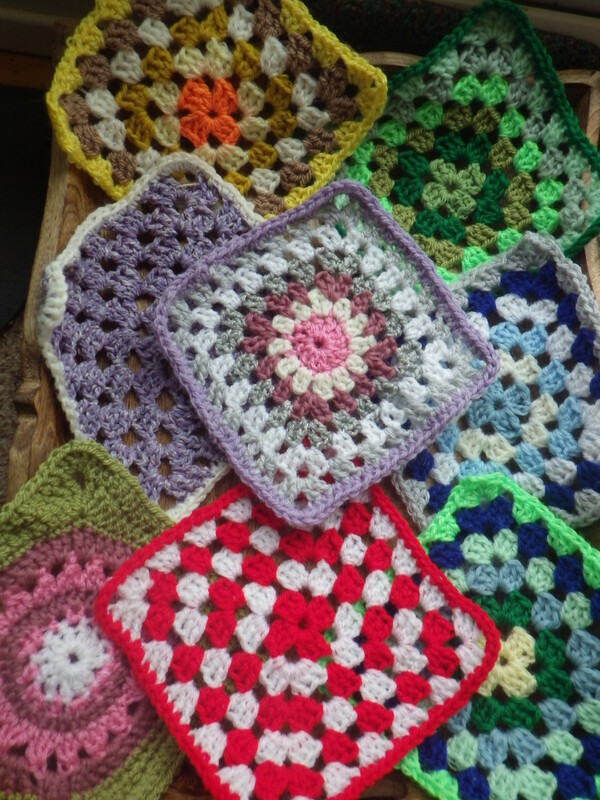 I’ve just read the latest post from Katrina at Crochet Crush in which she talks about making crochet flowers in spare moments whilst waiting to collect her eldest from school. 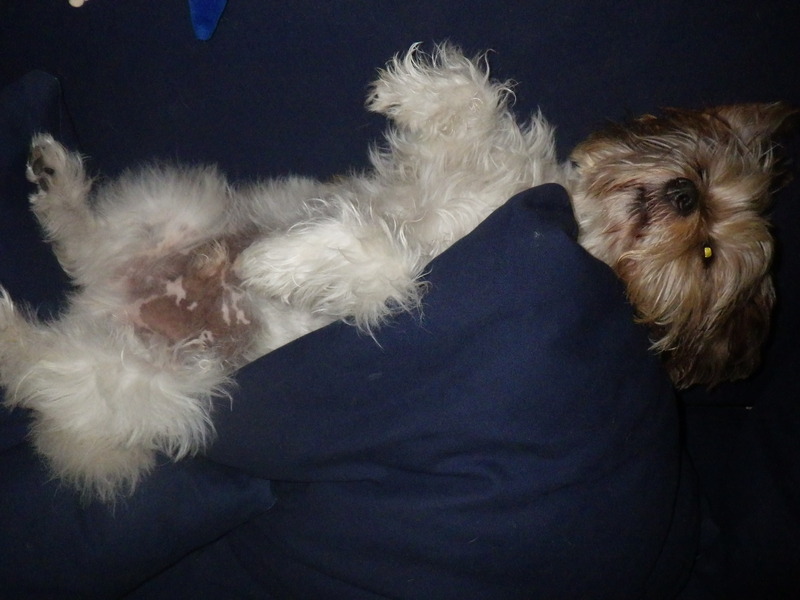 So what do you do when you have spare minutes or, like me, unsettled hours to fill?